There is a lamp inside a photography darkroom. When the darkroom door is closed, it is impossible to tell from outside the room whether or not the lamp is on. There are two switches outside the door of the darkroom. One or both of the switches may control the lamp. It also could be that neither of the switches control the lamp. All you know is that the light bulb is currently off and that the lamp and bulb are in working condition. The darkroom door is closed and once you open the door you cannot touch either of the switches. If you can only open the dark-room door one time, how can you tell which switches, if any, control the lamp? Turn the first switch on and leave it on for ten minutes. After ten minutes, turn that switch off and turn the second switch on. Open the darkroom door, and lightly (in case it is hot) touch the bulb. If the lamp is on, and the bulb is quite hot, both switches work the lamp. If the lamp is on, and the bulb is cool, the second switch controls the lamp. If the lamp is off, and the bulb is hot, switch one controls the lamp. If the lamp is off, and the bulb is cool, neither switch controls the lamp. 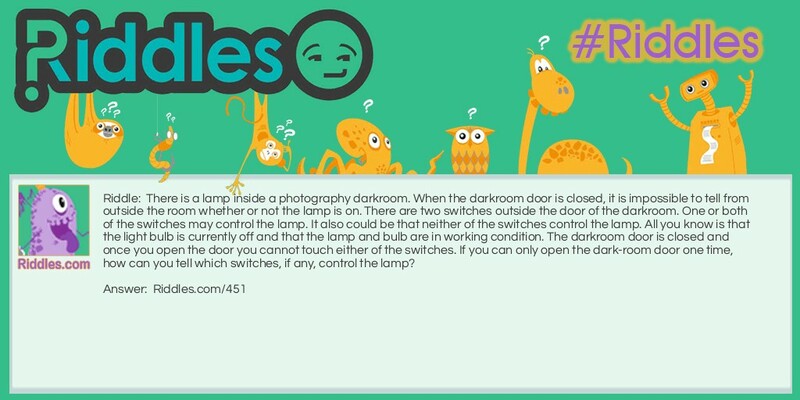 The Darkroom Riddle Meme with riddle and answer page link.